ASP offers a variety of products for your Fiber Handling and Bragg Grating Manufacting needs. The products are designed to support the R&D and Low Production enviroments. All products can be customized to meet you specific needs. 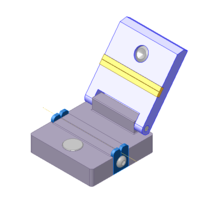 Our Fiber Clamps and Fiber Clamping Cards are designed for research and low producion use. Clamps are manufactured from Aluminum and come standard with our "patent pending" fiber retention guides. 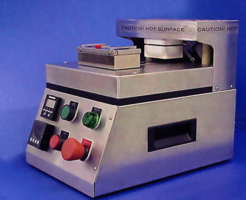 Models are also available with variable clamping force or in Stainless Steel for high temperature applications. All clamps are easily customized. Our Hydrogen Loading Systems are turnkey, fully automated systems that safely control temperature and pressure in a series of high-pressure vessels. 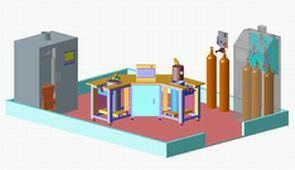 The systems are available in a standard 1 or 2 reactor chamber configuration. 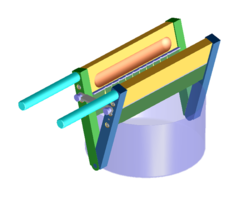 Configurations with up to 10 reactor chambers can be fabricated. Our compact ASP 500C Fiber Oven is a clean, safe, accurate method to supply up to 500 degrees of heat to your application. The units come in either a bench top or inline versions. Both styles have communication capability and come in a variety of fixed oven widths. Purged units are also available. Our Folding Fiber Chemical Stripping Fixture is a compact and lightweight solution for light production, research and development chemical fiber stripping requirements. The Polyethylene fixtures come in two standard stripping lengths 25mm and 50mm.